On Saturday, February 23 at the Minneapolis Armory, WBA number 3 welterweight and Minneapolis native Jamal James won a 6th round KO victory over Janer Gonzalez of Cartegena, Colombia. James, improving to 25-1 (12 KOs), looked arguably better than he ever has before. One must view his performance with great speculation, wondering when he is going to finally get his shot at a world title and against whom he will get the opportunity. 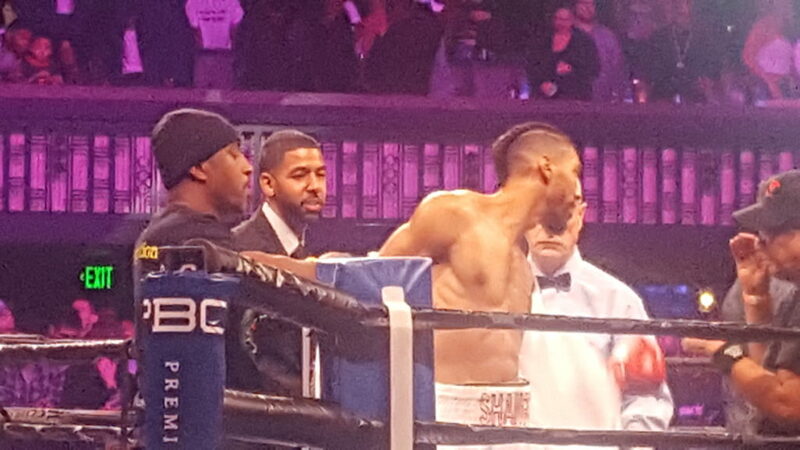 Jamal James entered the ring on February 23 with confidence, getting the knockout victory. James controlled the first round, stalking a bit, snapping a penetrating jab and landing combinations, Gonzales backing away in what was mostly a feel out round. James turned the momentum dramatically his way in the 4th round, particularly with his close of it, drawing punches from Gonzales he was able to evade and counter with powerful combinations that brought much of the crowd to their feet. The fight continued this way through the 6th, the tempo building as Gonzales gave back as hard as he was getting, but couldn’t land his punches as clearly, often landing on James’ arms and even missing. Then suddenly, as James pressed harder on the attack, landing fast combinations, he drove Gonzales to the ropes with a barrage of uppercuts to the body followed by the left hook and right hand to the head, landing what appeared to be a right uppercut that put him down. Gonzales survived to the end of the round, but his corner stopped the fight before the beginning of the 7th. Currently, since he is ranked number 3 by the WBA, the logical presumption is that he should be close to a challenge for the WBA title. The WBA Super Champion is Keith Thurman. Certainly, it’s a fair assessment to say James is much smoother than Thurman. He has great footwork and punch-slipping skills that Thurman doesn’t match, but he does not punch nearly as hard as Thurman. In fact, Thurman’s punching power may be something James has trouble with. The WBA Champion (meaning he holds only the WBA belt and no belts from other organizations, is Manny Pacquiao). Needless to say, Jamal has a chance against him, but Pacquiao, even at this late of an age (he turned 40 on December 17, 2018), is always dangerous. Not only does he hit naturally harder than almost any fighter at that weight, but his speed, balance and accurate punching make him one of the most dangerous pound-for-pound fighters in history. Even at 40 years old, Pacquiao would be an overwhelming challenge for James, but a victory over him is not impossible. James has a level of skill that poses a threat to the Pacman, plus a heart that always gives him a chance. Then there’s Terence Crawford, the WBO welterweight champion, who is scheduled to defend his title against Amir Khan on April 20 in New York at Madison Square Garden. As long as Crawford is healthy, he should destroy Khan in April and if he ever defends his title against James, he will be the most difficult champion for James to beat. Such a fight will be a tough, competitive one and James will pose a significant problem for Crawford, but Crawford—who is currently considered by many to be the best pound-for-pound boxer alive—will stretch James farther than he has been in his career. Finally, the most vulnerable of the recognized welterweight champions is Shawn Porter, who retained his WBC title with a close, some say even controversial split decision against Yodenis Ugas on March 9 in Carson, CA. It will be a great accomplishment for Jamal James to get a world title shot against any of these fighters and an even greater accomplishment to win. As each day goes by the possibility of Jamal James succeeding in such a challenge and winning another world championship for Minnesota Boxing appears more likely. As we enter into spring and James gets ready to watch his fellow Minnesotan, former IBF supermiddleweight champion Caleb Truax, fight April 13 at the Minneapolis Armory in a title elimination bout with former middleweight champion Peter Quillan, the emerging sunshine thawing our heavy winter into spring illuminates a historically monumental year for Minnesota Boxing.